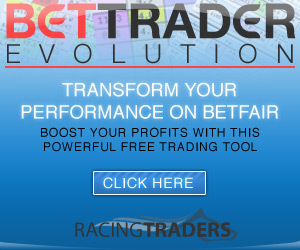 Here is our first foray into the world of tennis trading and who better to lead us than Mr Tennis himself, Tradeshark. This is based on a scalping method that doesn’t require live pictures. It can be used by novice traders because I give you the exact entry point for the trade and the exact exit point. Also I have made the decision about when to exit the trade if things don’t go as we hope. I would advise using the ladder interface on your trading application as you can enter trades with one click. You can also see the hedge figure in the ladder interfaces. You are looking for one of 2 scores…..either 15-40 or 0-40 (i.e. 2 or 3 break points) 15-40 is my favourite and also occurs more often. It offers a better price to enter the market. If the receiving player has got himself to 40 there is a very good chance he will win one of the next 2 points. Once you see one of the qualifying scores you back the receiver (or lay the server). Green up when the break point is won. During an average match you will get anywhere from 2 to 4 opportunities. Obviously more in 5 setters. If the server pulls back to 40-40 hedge for the loss and wait for the next opportunity. If the set has gone to a tie break wait until one player is 2 mini breaks up (i.e. has won 2 points against the serve) then back that player. This method works best on clay court matches or on any womens match. If the winner of the first set has 2 break points against them in the second set, be wary of entering the market. If the server comes back to 40-40 the loss could be greater than normal. An unsuccessful trade in a deciding set can leave us with a larger loss. Avoid using the method in deciding sets! As a general guide this method works best in WTA (womens) matches. Ideally you need the favourite’s price to be 1.40 or higher. This method can be used on ATP(mens) matches on clay but as stated above avoid situations where the server has a big consistent serve. As a beginner you are advised not to use this method on ATP matches on hard courts or grass. The reason for this is that these courts are faster and the serve is much more of an important shot. Many of the top players are capable of serving aces to get themselves back to 40-40. 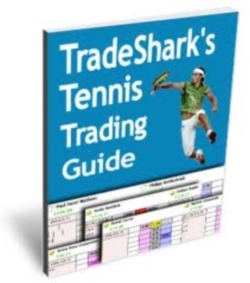 So if you want to know more about tennis trading then Tradeshark has an excellent Tennis Trading Guide and what’s more, we have secured a World Exclusive Deal on the guide and it is yours for just £25. Now you won’t get this price anywhere else on the world wide websphere! The guide contains everything you need to get started including….. In fact we will be trading over the summer months ourselves so do check back and see our progress, using the self same strategies that are included in the guide. So to get your hands on a copy for just £25, just click below. And do drop us a line if you need any further info and questions you have or even just to boast about your profits!